John Dillinger (June 22, 1903 – July 22, 1934) was an American bank robber, considered by some to be a dangerous criminal, while others idealized him as a latter-day Robin Hood. He gained this reputation (and the nickname "Jackrabbit") for his graceful movements during bank heists, such as leaping over the counter (a movement he supposedly copied from the movies) and narrow getaways from police. His exploits, along with those of other criminals of the 1930s Depression era, such as Bonnie and Clyde and Ma Barker, dominated the attentions of the American press and its readers during what is sometimes referred to as the public enemy era, between 1931 and 1935, a period which led to the further development of the modern and more sophisticated FBI. Dillinger and his gang members were believed to have robbed about a dozen banks and stolen over $300,000, an enormous sum in the Depression era, totaling nearly five million in today's economy. Dillinger was born on June 22, 1903, in Brightwood, Indianapolis, Indiana, and grew up in nearby Mooresville. He enlisted in the U.S. Navy, but deserted within a few months and was later dishonorably discharged. Dillinger returned to Indiana, where he married a local girl named Beryl Hovious and attempted to settle down. However, he had difficulty holding a job and his marriage disintegrated. One night in 1924, a small-time criminal who was a friend of Dillinger convinced him to collaborate in the mugging of a well-known Mooresville grocer named Frank Morgan. The two believed that the grocer carried a large amount of cash. They were soon captured. Dillinger's friend employed a lawyer and received only two years in jail, whereas Dillinger, unable to afford legal representation, was convicted and sentenced to 10-20 years in prison despite having no prior criminal record. It has been reported that Dillinger, who was a member of the prison baseball team, played so well that he could have been drafted under normal conditions as a professional major league player. Dillinger served time at the Indiana state penitentiary at Michigan City, until 1933, when he was paroled. Dillinger learned the criminal lifestyle while serving his time. He met bank robbers Harry Pierpont, Russell "Boobie" Clark, Charles Makley, Edward W. Shouse, Jr., Harry Copeland, "Oklahoma Jack" Clark, Walter Dietrich, and John "Red" Hamilton. Homer Van Meter and Lester Gillis (a.k.a. Baby Face Nelson) organized a gang known as the "Dillinger gGang." The gang spent their prison days planning bank heists and other criminal activities. Altogether, gangs with whom Dillinger was believed to have been associated robbed about a dozen banks and stole over $300,000, an enormous sum in the Depression era, totaling nearly five million in today's economy. Within four months after Dillinger's parole, he was back in jail in Lima, Ohio, but the gang sprang him, killing the jailer, Sheriff Jessie Sarber. Most of the gang was captured again by the end of the year in Tucson, Arizona, due to a fire at the Historic Hotel Congress. Dillinger alone was sent to the Lake County jail in Crown Point, Indiana. He was on trial for the suspected killing of Officer William O'Malley during a bank shootout in East Chicago, Indiana. During this time on trial, the famous photograph was taken of Dillinger putting his arm on prosecutor Robert Estill's shoulder when suggested to him by reporters. On March 3 1934, Dillinger escaped from the "escape-proof" (as it was dubbed by local authorities at the time) Crown Point, Indiana county jail, which was guarded by many police and national guardsmen. Newspapers reported that Dillinger had escaped using a wooden gun blackened with shoe polish. Dillinger further embarrassed the town, as well as then-42-year-old Sheriff Lillian Holley, by driving off in her brand new V-8 Ford. The press augmented her chagrin with such headlines as: "Slim woman, mother of twins, controlled Dillinger as sheriff." Driving across the Indiana-Illinois state line in a stolen vehicle, Dillinger violated a federal law and, thus, caught the attention of the Federal Bureau of Investigation. An investigation concerning the facts of the escape was carried out some time later by the Hargrave Secret Service of Chicago on the orders of the Illinois governor. The governor and Illinois state Attorney General Philip Lutz eventually chose not to release information because they did not want Dillinger to know of the informants with whom they spoke. As a result, the findings about the gun in the escape were never made public, and this, coupled with Dillinger himself actively perpetuating the wooden gun story as an ego boost, is a reason many believe the "wooden gun" escape was real. The truth behind the infamous gun may never be known. Once out of prison, he continued to rob banks. The United States Department of Justice offered a $20,000 reward, on June 23, for Dillinger's capture, or $5,000 for information leading to his apprehension. Dillinger was shot and killed after attending the film Manhattan Melodrama (coincidentally, a gangster film) at the Biograph Theater in Chicago, on July 22, 1934. He was accompanying his girlfriend, Polly Hamilton, and Ana Cumpanas (a.k.a. Anna Sage), who was facing deportation charges for running a brothel. Sage worked out a deal with Purvis and the FBI to set up an ambush for Dillinger and drop the deportation charges against her. When they exited the theater that night, Sage tipped off the FBI agents who opened fire into Dillinger's back, killing him. Dillinger was struck three times, twice in the chest, one actually nicking his heart, and the fatal shot, which entered the back of his neck and exited just under his right eye. According to Purvis, Dillinger died without saying a word. Sage had identified herself to agent Melvin Purvis by wearing an agreed-upon orange and white dress, which due to the night lights, led to the enduring notion of the "Lady in Red" as a betraying character. Though she had delivered Dillinger as promised, Sage was still deported to her home country of Romania in 1936, where she remained until her death, 11 years later. The Biograph Theater in Chicago, June 2007. 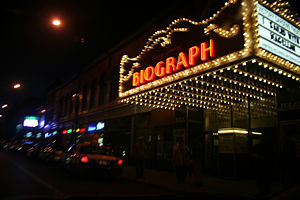 Contrary to newspaper accounts and later depictions in a score of movie re-enactments, those waiting in ambush outside the Biograph Theater that night were operating under the understanding that Dillinger was to be shot on sight. Purvis had assembled a team of both FBI agents and hired guns from police forces outside Chicago (Milwaukee, Michigan City, Indiana, etc.) because it was felt that the Chicago police had been compromised and could not be trusted. As a matter of fact, during the stakeout, the Biograph's manager thought the agents were hoodlums that were setting up a robbery. He called the Chicago police who dutifully responded and had to be waved off by Purvis, who told them that they were on a stake out for a much more mundane quarry. Earlier in the day, Sage had called Purvis and told him that Dillinger was considering going to two different theaters that night. Two theaters were mentioned; one, the Marbro, was downtown, and the other was on the North side (the Biograph). Not chancing another embarrassing getaway, Purvis split the team of shooters in two and dispatched one team downtown while he accompanied the other group to the Biograph. Three times that night he told the crews to "insure there was no escape." He also warned them repeatedly to "not take any chances with Dillinger." When the movie let out, Purvis stood by the front door and signaled Dillinger's exit by lighting a cigar. Both Purvis and the agents reported that Dillinger turned his head and looked directly at Purvis as he walked by, glanced across the street, and then moved ahead of his female companions and bolted into a nearby alley where he quickly came under fire from a number of different guns. No warnings or verbal communications of any kind were exchanged. An ambulance was summoned and although it was clear that Dillinger had quickly died from his gunshot wounds, he was taken to a nearby hospital where his corpse was briefly placed on the grass outside the emergency room where he was officially pronounced dead. To this day, loyal fans continue to observe "John Dillinger Day" (July 22) as a way to remember the fabled bank robber. Members of the John Dillinger Died for You Society traditionally gather at the Biograph Theater on the anniversary of Dillinger's death and retrace his last walk to the alley where he died, following a bagpiper playing "Amazing Grace." To this day, there are doubts whether Dillinger actually died on July 22, 1934. Some researchers (chief among them famed Chicago crime writer Jay Robert Nash) believe that the dead man was in truth a petty criminal from Wisconsin named Jimmy Lawrence, who had dated Dillinger's sometime girlfriend Billie Frechette and bore a close resemblance to the famed bank robber. Some people who knew him said they did not recognize the body; in fact, Dillinger's father had suddenly exclaimed when first seeing his son's corpse, "That's not my boy!" It is noted that John Dillinger received rather crude plastic surgery some time between the time his father had last seen him and his death. In 1963, the newspaper The Indianapolis Star received a letter from a person called "John Dillinger" with a return address in Hollywood, California. The letter contained a photo of a man who looked like a more aged Dillinger. When this letter was ignored, another letter was sent to Emil Wanatka Jr., the proprietor of the Little Bohemia Lodge. ↑ The Officer Down Memorial Page, Sheriff Jess L. Sarber. Retrieved October 11, 2007. ↑ The Officer Down Memorial Page, Patrolman William Patrick O'Malley. Retrieved October 11, 2007. ↑ The Officer Down Memorial Page, Dillinger's Dupes: Town Seeks to Preserve a Jail Yet Escape a Dastardly Deed.Retrieved October 11, 2007. ↑ The Officer Down Memorial Page, Special Agent W. Carter Baum. Retrieved October 11, 2007. ↑ Allan May with Marilyn Bardsley, Biograph Encounter, Chapter 12. Retrieved October 11, 2007. Dillinger Slain in Chicago; Shot Dead by Federal Men in Front of Movie Theatre. This page was last modified on 15 May 2018, at 19:42.